Ciao! Baby Chairs are portable bag chairs that fold out in to a high chair. It was created because families with small children need a solution that will make life easier during mealtime and snack times. 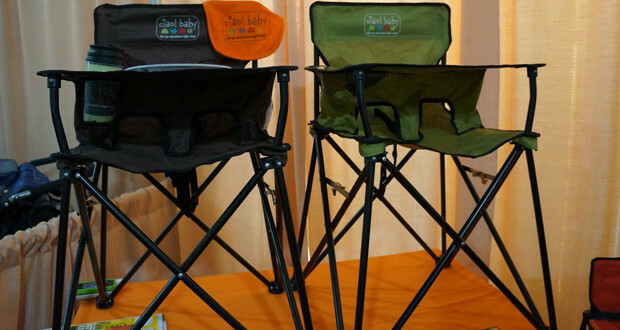 This chair will give any parent peace of mind at their campsite knowing their baby is safe in their high chair. Without the portable high chair you are forced to hold the baby constantly for feedings, sit it on the ground or try and prop it up in an adult chair, non of which are great options. The Ciao! Baby is great for the active family and camper. These chairs are stable and come equipped with an easy wipe off tray with cup holder. The high chairs are compact and have a bag for easy carry. They come in multiple colors, even your favorite college team and can be found at retailers across the US. Requires no table, chair or any other mechanism to work! All one piece & no assembly required!